They spin! They clap! They wear rubber masks! Ladies and gentlemen, for one night only (or maybe two), it's 1968's "Kiddle Komedy Theater!" 1968 appears to have been a banner year for Mattel, at least as far as their doll lines go. About three million dolls seem to have been introduced in the vast and eclectic Kiddle line (see my related articles on the subject), Barbie and her cosmopolitan friends were as popular as ever, even beginning to introduce some flower-power "hippy" variations into the group, as well as "tan" versions of our "perfect plastic playmates." The "Matt Mason" line flooded the market with collectible bendy astronauts (see my article on the "Outer Space Men" for more info on the subject). But for toy kits there was probably very little as unique as the puppet show play set Mattel released that year. For one reasonable price (around $5.00 apparently) you got a complete "Komedy Theater," two performers and their related accoutrements. You could put on shows for your friends or, more likely, run the shows over and over and over for yourself, all day and night! Ladies and gentlemen, boys and girls, introducing those two Krack-up Kiddle Komedy Komedians and their in-Kredible Kiddle Theater! 1) Who were the Kiddle Komedians? It's hard to find out where the "Kiddle Komedy Klubhouse" features in the Kiddle pantheon; there were two characters, an un-named blonde boy and girl and while the girl bears a vague resemblance to some of the females in the Kiddle line "Boy" looks very little like any of his supposed relatives ("Bunsen Bernie," "Peter Paniddle" or even "Todd," Barbie's bendie brother). What is known is that the characters were armature puppets in a small plastic box "stage" where they were supposed to be two young kids in their bedroom who appear to be two young kids putting on a show where they pretend to be in their bedroom and then a haunted house and then...how did this sentence start again? Well, never mind. The Kiddle "actors" were around 5" tall and their bodies were attached to a free-floating lever that came out from beneath the viewing stage. If you pushed the trigger on the lever the dolls would swivel right and left as if spinning, if you squeezed the trigger they would clap hands. They came with an assortment of rubber masks and sponge animals and the "theater" had a reversible cardboard backdrop to represent either the serenity of the kids' bedroom or the horrors of a malevolent haunted house. The set came with a small cardboard disc record much like the ones that used to come on cereal boxes in the 70s (yes, that dates me, and you, if you remember!) and the record was about as durable--and listenable--as something that had been INSIDE a box of cereal. You were supposed to play the record and move your puppets as the "Kiddle Komedians" talked you through the show, indicating when to clap hands and spin. I understand you could send away for an "upgrade," another record and set of masks that took the kids to the circus but these seem to be very rare indeed. Behold, 1968's friendly and fearsome intergalactic rubber and wire warriors, the "Outer Space Men!" Liddle Kiddle Clone Klone Little Kiddles Doll Lot 2" - 2.75"
2) How was the show? 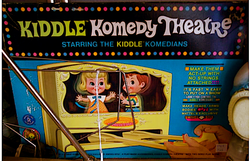 To be fair, the "Kiddle Komedy Theater" was aimed at a pretty young demographic, and I was a bit older than the target age when I first encountered them so I may not be the best judge, but I found it a pretty simple and effective toy over all. A neighbor girl owned the set and sold it to me under great duress when she outgrew it; I was enchanted watching her perform the show and dreamed of putting it on myself for throngs of appreciative fans someday. The concept was very "Romper Room" (again, dating myself), lacking the wit and edge of, say, "Dr. Suess" ("Cat...hat...in French, chat chapeau!"). It was all innocent fun and "Let's try on this mask" and "Ooh, isn't this haunted house scary but I'll bet the witch turns out to be a friend instead of a fiend!" The kids on the record were sincere unto obnoxiousness and the adventures they got up to were hardly the stuff of high drama but it was all entertaining enough, at least if you were the puppet performer. In truth, the thing was a lot more fun to play with than watch, I'm sure, though I never asked anyone in my audience for a review when I performed it, fearing the worst. After my brother and I got bored acting out the performance on the record we removed the dolls from the stage and started making them spin and clap in much more dire situations with some of the monster toys I'd collected and if we didn't improve on the original production values we certainly had a lot of fun squeezing the trigger and making the characters dance around, regardless of the situation they were in. "Opening Night At The Komedy Klubhouse!" You spin me right 'round, baby! 3) There's something "funny" going on. There were all sorts of puzzling aspects to the "Komedy Theater." First and foremost, the little boy on the box cover had brown hair and the boy inside the box had blonde hair. I assumed at first the boy was just experimenting with peroxide to enhance his career image or something (maybe his role in Kiddle Komedy theater DEMANDED it) but the face of the boy inside looked considerably more...mischievous as well, it wasn't even the same model. There's just something about the kid's vacant stare (not to mention his excessive eyeliner) that made me mistrust him. It was also unnerving that his jeans were cut to fit over the puppet armature so he looked like he was wearing a navy-jeans skirt, a garment that was popular at the time. Further, his voice on the recording sounded a bit like a young woman, a common enough thing in plays and films, but sometimes a bit unsettling. Is it possible some envious Kiddle usurped the original "Boy" performer? 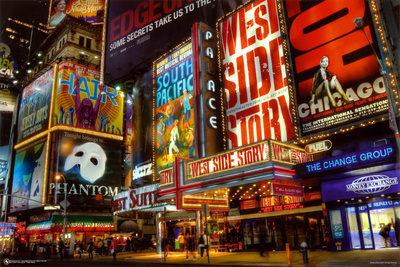 "Life upon the wicked stage/ain't ever what a girl supposes," as the old song goes. More potentially disturbing, the haunted house sequence required the kids to don two small rubber masks. One was a green witch face, the other one was...well...Satan! I never quite understood what was going on that required the summoning of Old Scratch into the gentle scenario of the kids' bedroom and no explanation was forthcoming on the record (unless, perhaps, you played it backwards I suppose). Was there an alternate version of the Komedy Klubhouse Kapers that was more akin to the 70's classic "The Exorcist?" If so, I really didn't want to know and was always glad when the "Haunted House" sequence ended. These things were coupled with the fact that the "Kiddle Komedians" really didn't seem to fit into the world of the Kiddles at all and lived in a sort of bizarre puppet world all their own. In short, it was a unique toy but definitely had a limited playability factor. The run of the "Kiddle Komedy" show doesn't seem to have been too long; by 1973 or so when I "Kaught" up to it (so sorry!) the look of the characters and set seemed pretty dated, "Sesame Street" had fully caught on--only "Muppets," or hand-type puppets were really "cool" by then. The limited actions of the dolls coupled with the limits imposed by only having one record to perform to made the somewhat cumbersome (and probably expensive to produce) toy a bit of a miss; production didn't last long and the set usually sells for modest prices on eBay, even when all the small, elusive props and things are present and the cardboard is in great shape. It seems there were just not enough theater fans in the pre-school age to make the "Kiddle Komedy Theater" a smash hit on the performing Kiddle circuit. That being said, it's still a really interesting one-of-a-kind toy and I've not seen its like before or since. Let's just hope the Kiddle Komedy Performers didn't grow up to be jaded Hollywood thespians scrounging for work in info-mercials! The definitive guide to all things "Kiddle"